Style and comfort are the telltale aspects of high-quality designer pret-a-porter wear. The top-tier Italian blouses for women at Marilyn’s meet this description perfectly with their fine materials and exquisite workmanship. Located in Naples, FL, the high-end specialty clothing boutique houses some of the best designs from current European fashion trends. Store owner, Marilyn Hellman, works with some of the most creative Italian designers to give her inventory a unique look. The new blouses for women are a collaborative effort between Marilyn and Italian designer Gaia Boldetti. While Gaia’s intricate creations capture the heart of European fashion, Marilyn’s input helps gear the style toward her clientele back in Naples. The resulting fusion of designs is something every woman would want to make a part of her wardrobe. 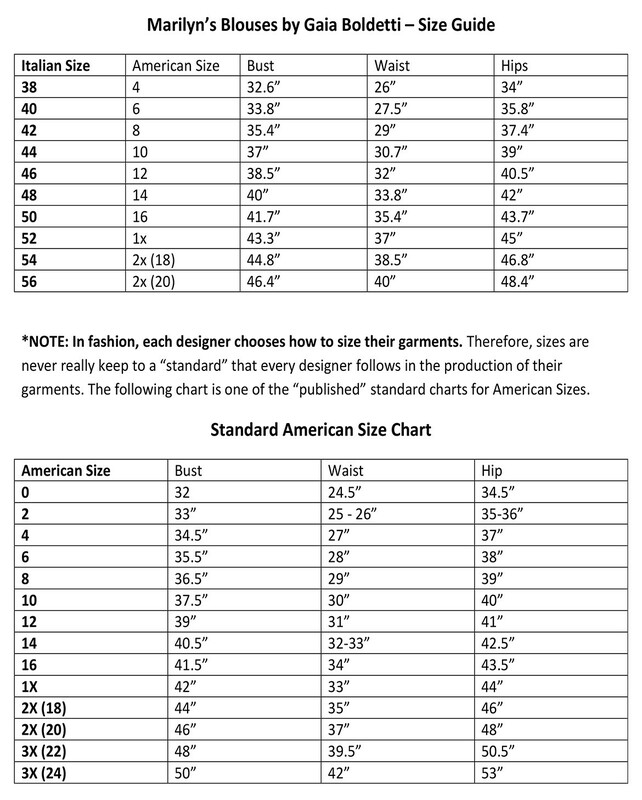 When you order a “Marilyn’s by Gaia Boldetti ” blouse please check the following measurement chart.